Utterly delicious. It’s a foaming, frothy pop-country outing that’s drenched in melody, harmonies and happy-feet rhythm. This sparkles with sunshine and begs for a drive on an empty two-lane blacktop. Summer is officially here. 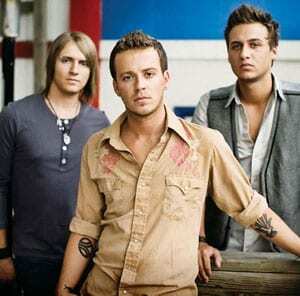 Love and Theft is the Carolwood Records trio of Stephen Barker Liles, Eric Gunderson and Brian Bandas, and “Runaway” is the group’s debut single. The young group’s career to this point has been filled with some magic moments. To make matters sweeter, Taylor Swift heard the trio’s music and brought them on board as an opening act for her headlining concerts in 2008. Others quickly came on board–like Robert Ellis Orral and Jeff Coplan, who are producing the group’s debut album. In fact, all three are able songwriters who wrote or co-wrote every song on their debut album. They met not long after each arrived in Nashville, and their special chemistry enabled them to forge a unique sound.